All-day brunch spot and bakery. There was a time when the West Town Diner was the Bleeding Heart Bakery and the center of an epic saga of anger, bitterness, and pastry. But that was last year. 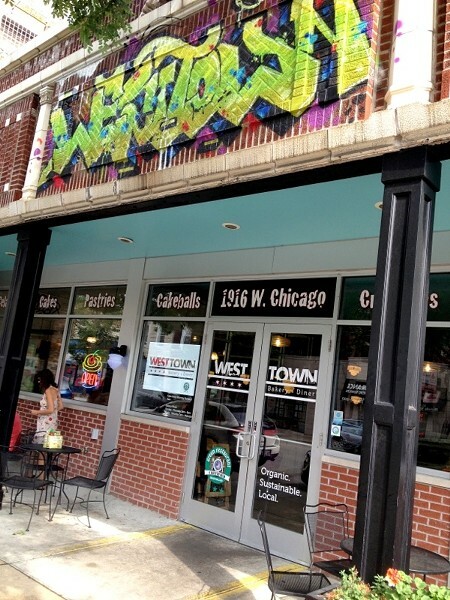 Now the West Town Diner is all about organic, sustainable, and locally sourced baked goods—and also doughssants, pastry chef Chris Teixeira's interpretation of the "cronut," the croissant/doughnut hybrid that has been inspiring New Yorkers to commit great feats of line waiting all summer long. Chicagoans aren't as insane about doughssants, maybe for good reason: it was indeed crispy and flaky, but, aside from the bitter coffee cream cheese filling, it tasted more like oil than anything else. The chilaquiles were also oddly tasteless, as was the chicken part of the chicken and waffles. The waffles, though, were fluffy and sweet, and the whole thing came topped with thick, chewy bacon and a fried egg, all of which, along with a little salt, made up for the chicken. The whole plate said, "You are going to get very fat." Those waffles appear on the menu in several other iterations. The diner booths are comfortable. If you're going to get fat, there are worse places to do it. But only if you skip the doughssants, which are also available at West Town Bakery's new location in the Acme Hotel (15 E. Ohio).